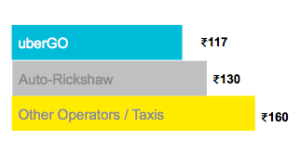 Today we take another step towards making Uber available to over 1.2 billion Indians. We are excited to announce the launch of uberGO; a spanking new range of low cost, chauffeur-driven hatchbacks (think Tata Indica Vista and Maruti Suzuki Swift) that roll onto the streets of every Uber city in India today. For this launch, drivers are able to connect to the Uber platform using devices provided by our technology partner, Huawei. There hasn’t been a smarter, cheaper and safer way to get around your city. Download the app and enter promo code “UBERGO-INDIA” to get Rs. 400 off your first Uber ride! WHEN CAN I USE UBERGO? uberGO signifies a speedy, utilitarian and simple solution to get around quickly; without the need to have second thoughts about choosing it! It’s perfect for absolutely any kind of ride, especially the short hauls – think quick bank runs, short trips between meetings, jaunts to the mall and the movies; with uberGO even the mundane daily commute to work can now be stress-free and relaxing. All this for a price lower than an auto-rickshaw. HOW MUCH DOES UBERGO COST? At launch, we’re testing the very limits of low pricing with 35% off on regular fares. No promo code is necessary, this promotion will be automatically applied to your uberGO rides in Hyderabad. Now there’s an Uber for your every need; use uberGO for your everyday commute and errands, request an uberX when you have company, and step up to UberBLACK when you mean business. 1) Download the Uber app and register if you haven’t already. 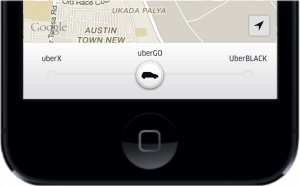 3) At the bottom of your app, you’ll see the uberGO option – slide over! 4) Set your pick up location and hit request – your uberGO will arrive in minutes.